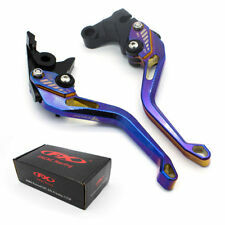 Brake Lever Color: Black. Mirror Holder Thread: 10mm. Adjustable reach system provides the perfect lever position for all riders. Hydraulic and Clutch Brake. Banjo Bolt Size: M10x1.25mm. Quantity: 1 Pair(Left & Right). FZS600 FAZER 1998-2003. 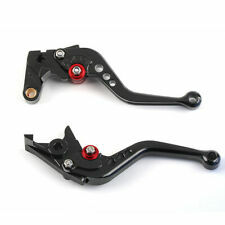 This pair of brake and clutch levers are compatible with models One pair of clutch brake levers for the model above. For example,short black levers with red adjustor. Top CNC Machined. 2008-2010 zx10r original set of brake and clutch lever. These replace the old and standard levers. These levers are easy to install and take approx. short levers for 2 finger operation. YAMAHA SHORT BRAKE AND CLUTCH LEVER SET. REPLACE OLD LEVER WITH NEW LEVER AND GREASE PIVOT BOLT. GSF1200 BANDIT K1-K5. SV1000 K3-K6. For Suzuki GSF1200 BANDIT 2001-2006. For Suzuki GSF650 BANDIT 2007. Claims outside this period will not be accepted. For Suzuki GSF1250 BANDIT 2007-2015. For Suzuki Bandit 650S 2015. Color：Black Lever, Red Adjuster. New Suzuki SFV650 Gladius Rear Brake Lever / Pedal. Fits Suzuki SFV650's from production years K9 - L5. • Adjustable length guard for lever variation to suit most handle bar and lever types. • CNC machined guard mount. Bar end fittings; will fit most handle bars. All Warranty Issues MUST go through their appropriate Manufacturer. Universal Standard 7/8" (22mm) Front Brake Master Cylinder & Cable Clutch Perch with Adjustable Levers and Fluid Reservoir Full Kit. Universal Motorcycle Clutch Brake Master Cylinder Kit Reservoir Levers Set OEM. 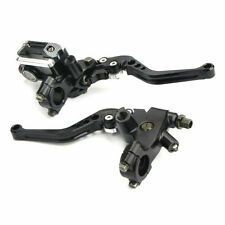 250cc~500cc 7/8" 22mm CNC Motorbike Handlebar Hydraulic Brake Master Cylinder Clutch Lever. Universal standard 7/8" (22mm) and cylinder front brake master cylinder & clutch with adjustable levers and fluid reservoir. For GY6 motorcycle with front disc and rear drum (If you confirm the shape of the screw position of the brake head of the original car and this brake pedal is consistent). -The clutch car does not support the use. For KAWASAKI NINJA 300R 2013-2017. No modification! Ultra precision machine cut for super light weight construction, high precision and quality. We will send out this item as title show. GSF600 BANDIT 1995-1999. GSF650 BANDIT 2005-2006. GSF 600S BANDIT 1996-2003. GSF 250 Bandit All Years. These replace the old and standard levers. These levers are easy to install and take approx. FILTERS AIR OIL AND FUEL. EXHAUSTS & ACCESSORIES. ENGINE & GEARBOX. Read on. Our Ref : 100162. "Great value". WHEEL & BRAKE. SHOCK ABSORBERS & COVER SETS. Superior CNC Machined Billet. -- Quantity: A Pair (clutch&brake). For Yamaha WR125X/WR125R 2009-2013. -- 6 Adjustable Positions. -- Made of high Quality T6061-T6 Aluminum. We will send out this item as title show. For BMW G310R G310GS 2017-2018. 4:Custom Cadmium Plated Springs & Brass Pivot Bushing. Racing Brake & Clutch Levers. 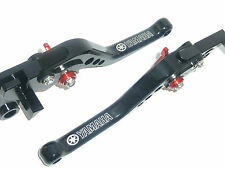 Type: Brake & Clutch Levers. 2 pcs (Brake & Clutch). 3:7075 Type 3 Black Anodized Cam Block For Improved Longvity. ZXR400 all years (F-14/K-750). VERSYS (650cc) 2006-2008 (F-14/K-750). ZZR600 1990-2004 (F-14/K-750). ZX9R 1998-1999 (F-14/K-750). With 6 pisition adjust,you can feel free to change the adjuster. Material: CNC Aluminum alloy. Claims outside this period will not be accepted. GSF1200 BANDIT. Car Rear Wings Spoiler. Brake Clutch Lever. GSF1250 BANDIT. GSF650 BANDIT. Handlebar/Hand Grip. After ensuring they fit, grease the Pivot Point of the new Levers. 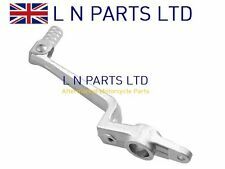 Hi Front brake pattern lever to fit Honda cbf 125 2009-2012 approx, will fit other models. 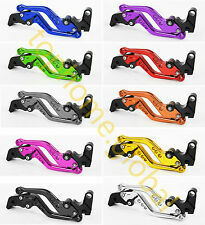 Motorcycle Brake Clutch Levers Protect Guard. 1 Pair Levers Protect Guard. Hot Brake Clutch Lever Protector Protection Guard handguard for Motorcycle 7/8" 22MM. Adjustable levers and adjustable length,angle. Hot 7/8" 22mm Motorcycle Universal Silver Clutch Brake Lever Master Cylinder Oil Reservoir. 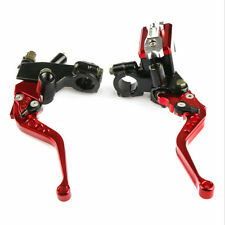 1 pair adjustable brake & clutch Master Cylinder levers (Left Right). Levers are Adjustable. Two Fingers Short Levers. For YAMAHA FZ1000 FAZER 2001-2005. For YAMAHA FZ6 FAZER 2007-2009. For YAMAHA FZS 600 FAZER 2000-2001. For YAMAHA FZS 600 S FAZER 2002-2003. For YAMAHA YZF R1 2002-2003. For YAMAHA YZF R6 1999-2004. YAMAHA MT-125 MT125 2015-2016. Stripe levers(mixed levers),special design,cool and durable. Size: 177mm(long levers). A brake clutch levers. We use the CNC carving design,the item have the unique fashion logo design. A pair of replacement front brake and clutch lever. Right is the clutch handle and left is the front brake handle. Standard brake and clutch lever set. Lever supplied will be same color as the manufacturers original lever. Hard anodized colors. Easy to install & perfect fit & no modification included. Fit for Honda CBF 125 2009-2013 lever. Please check picture with your original lever for correct fitment. Color Black Material Aluminum Weight 137g Type Disc Brake Brand Unbranded/Generic MPN OPO62876574541 Manufacturer Part Number Does not apply EAN 0762876574541. For KAWASAKI NINJA 300R 2013-2017. No modification! Ultra precision machine cut for super light weight construction, high precision and quality. We will send out this item as title show. Automatic lever position restoration provides quick recovery from the crash. Z1000 2007-2016. LASER ENGRAVED 'Z1000' (SEE PHOTOS). These replace the old and standard levers. 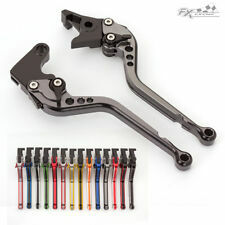 KAWASAKI FOLDING AND ADJUSTABLE BRAKE AND CLUTCH LEVER SET. These levers are easy to install and take approx. One used but in very good condition front clutch lever. UK Motorcycle front master cylinder pump Aluminum alloy Fluid Oil Reservoir Cup Universal. 1 x Fluid Oil Reservoir Cup. 1 x Oil pipe. Oil cup size: 28mm I/D, 36mm Height. Color: Black (Blue, Red, Gold, Silver are also available). Replica Doherty brake lever and clutch lever. Used on a wide variety of British motorcycles. 1290 Super Duke R/GT 2014-2016. 990 Super Duke 2005-2012. 690 Duke 2008-2011. KTM RC8 / R 2009-2016. E-checks will be held until cleared. Brake Lever. Brake Lever made by one of the large manufacturers and are made in Taiwan. Surface : CNC Finished. Multiple colors anodized cam block for improved longvity. Material : High Quality Billet Aluminum. E-checks will be held until cleared. We are an approved Motorcycle MOT Testing Station and Specialise in Motorcycle, Scooter & Electric Bike Sales, Servicing and Repairs. Add to Favourites. View Our Categories. If you have any problems with any of our parts we are here to help resolve any problems. Yamaha YZF R6 1999-2004. YZF R1 2002-2003. This pair of clutch brake levers are compatible with models One pair of clutch brake levers for the model above. For example,short black levers with red adjustor. Universal Blade Type Levers. Brake & Clutch Lever (Pair). Fitted to Many British Classics. HYPERMOTARD 821 SP 2013-2015. HYPERMOTARD 939 SP 2016. These replace the old and standard levers. DUCATI SHORT BRAKE AND CLUTCH LEVER SET. These levers are easy to install and take approx. As a result, this saving is passed on to you. Motorcycle Recycle reserve the right to refuse any voucher code application or redemption if there is any suspicion of fraud or foul play. Collections will need to be arranged in advance & within our office hours. To Fit Model : RM125 88. Subtype : Lever. Type : Lever. Call01302 338600.